We were so honored this morning to have one of our photos chosen as the best black & white on the Pioneer Woman’s blog. What? Haven’t heard of her? Where have you been? David’s sister, Monica, got us hooked on her a couple of years ago. I loooooove her writing style (hilarious) and photography tips & actions. Dave, however, is completely over the moon for her recipes. I can’t tell you how many times I’ve come to work on the computer and there on the screen is some gooey, buttery, cheesy recipe left open for me to (hint,hint) look at. Needless to say, her new cookbook is on our Christmas list! Here’s the winning pic. Dave submitted it and surprised me with it when it made the top ten. This has been a long-time favorite of our daughter, Emma. Mostly because it’s so true-to-life. I didn’t set up this shot. 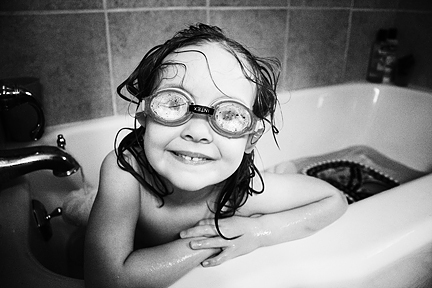 She really is a goggles-in-the-bathtub kind of girl (and yes, if you look closely you’ll notice they are upside down – so typical). After all, this is the child who is asking Santa for a tuba for Christmas. Heaven help us. This was a non-professional camera shot… taken with our good ol’ every-soccer-mom-has-one Canon Rebel (with the kit lens). No flash or supplemental light. Just tungsten bathroom light and a steady hand. It has been dodged and burned somewhat to draw more attention to Emma, and I did need to slightly enhance the eyes since they were getting lost in the foggy lenses. Thanks to everyone on the PW blog who left encouraging comments. We had incredibly wonderful competition, which is why it’s such an honor to win. Thanks Ree, for choosing us!!! LOVED your shot! Your photo and also the beautiful wrinkly old man photo were by far my FAVORITES!! Congratulations on your win!! Hmmmm … now you have to decide what you’re going to do with the $250 gift card. I’m sure you’ll find some way to spend it, hahahha! Blessings on you and your family this Christmas. Awesome shot… and love that it was unlit. Gives me hope!!! Stopping by to catch up on your latest posts. Congratulations!